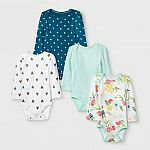 Kohls Cardholders has 3-Sets Baby Carter's 3-Piece Outfits for $16. Shipping is free. Apply code "MITTENS30"; "BABY10"; "FREEMVCJAN"
No, only works for HP Jordana. //@Anonymous: Doyou know if the 3-piece, size 3T is compatible with the HP touchpad? Doyou know if the 3-piece, size 3T is compatible with the HP touchpad?